Jeff and I took the opportunity to brew our fifth collaborative beer while he was down visiting for Thanksgiving. As mentioned in our Mason Dixon Line Mead post, we had a unique opportunity to utilize some Rhode Island wildflower honey from a friend of Jeff's and we wanted to make something special with it (thanks again Bil!). The honey's aroma and flavor were fascinating and complex with hints of lavender and some herbs like mint. When deciding on what recipe to brew, we ended up making a play on the ubiquitous honey wheat style that has gained favor as a "gateway" beer in the American craft beer segment. However, true to our collaborative brew goals, we wanted it to be a much bigger beer that could be aged over time. In the end, we decided on brewing a Wheat Wine with honey, or a Wheat Wine Braggot. Officially, a braggot is a derivative of mead, or honey wine. As one would expect, braggots are a hybrid between beer and mead with fermentables coming from both the honey as well as malted grains. Some sources state that a minimum of 50 percent of the fermentables have to come from honey to be called a braggot (ours is about 20 percent), but other sources state that only 25 percent need to come from the honey. Our recipe is right on the latter edge. When formulating the recipe, Jeff was fortunate to interact with Sean Paxton, The Homebrew Chef, via email, to get some guidance and suggestions on brewing a great wheat wine. 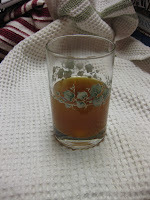 Using Sean's feedback, the base wheat wine recipe was put together. As Jeff and I discussed the beer, the decision to bolster the recipe with honey came afterwards. Originally, the honey addition was must smaller (1-2 lbs) and was included primarily bump up the gravity in the beer. However, we really liked the thought of what flavors honey would bring to recipe. In the end, the honey addition continued to be increased until we ended up with what is printed below. All of this was decided upon before we actually had the RI wildflower honey in hand, and once we were able to taste the raw honey's complexity, we knew we made the right decision. During any large family gathering, like this Thanksgiving, finding time for Jeff and I to brew together is always a challenge. In this case, we brewed the wheat wine late in the night after all the kids were put to bed, resulting in another post-midnight brew session (hence the beer's name). The braggot has just been bottled and it is cloudy like many beers with a significant amount of wheat (this despite cold stabilization and fining with gelatin). The collaborative brew has a complex flavor and I am excited to see what a little aging will do to it. The recipe and notes for the beer are listed below and I will update the notes as the beer continues to age. Brewed on 11/23/10 by the Wallace Brothers. Fifth collaborative session brew. After the mash and sparge was complete, we added the 3 lbs of DME because our pre-boil gravity was lower than expected. Aeration was accomplished via an aquarium pump and diffusion stone, run for 20 minutes. Yeast was pitched at 64 F and fermentation started within 12 hours. Fermentation was allowed to ramp as high as 70 degrees after the first 48 hours to help the beer attenuate. 12/12/10 - Dropped the beer to lager temperature (~40 F) to help clear it. 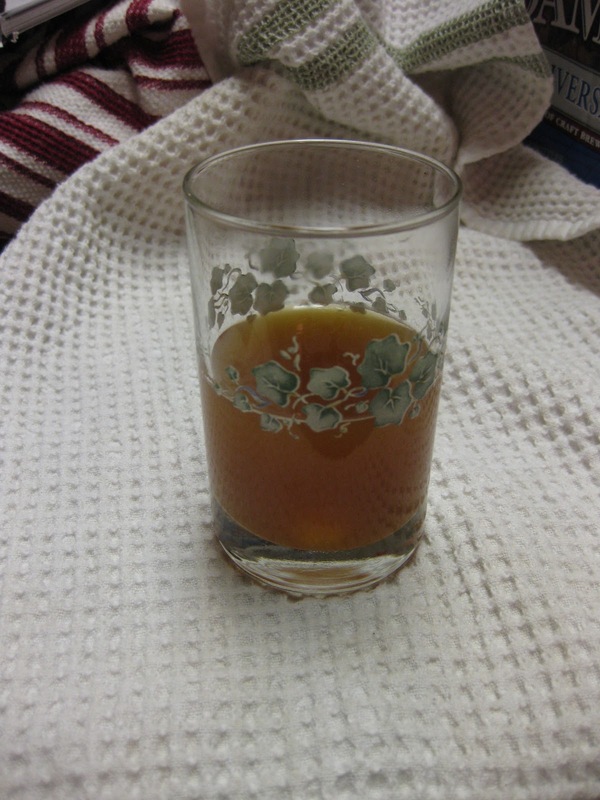 12/15/10 - Added 3 tsp of gelatin clarifier in one cup of 140 F water to the cold beer to help clear it. 12/21/10 - Bottled with 4 Muntons carb tabs per bottle. SRM is approximately 12 (I love this beer math iPhone app that does color approximation). Appearance is a hazy golden-honey color. Smells yeasty with some caramel and a bit of clove. Flavor is complex and warming with a firm bitterness in the middle and a notable fruit/citrus flavor in the end. No detectable hot alcohols. 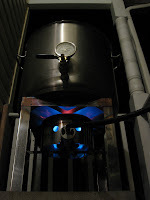 2/27/11 - Samples of Midnight Wheat were submitted to the 2011 Boston Homebrew Competition, where the beer was awarded a bronze medal in the Fruit/Speciality/Wood-Aged/Smoked category. 4/18/11 - Wrote an article on the Midnight Mini-Wheats, a version of this beer that I tried to brew by dramatically lowering the ABV. 4/22/11 - Midnight Wheat scored a 41.5 in the first round of the 2011 NHC and advanced to the Mini-Best of Show. It did not medal or go onto the second round of the NHC. Best competition score I have received to date. 10/9/11 - Brewed a new double batch of Midnight Wheat with Kenny. Hoping it turns out as good as the first batch.